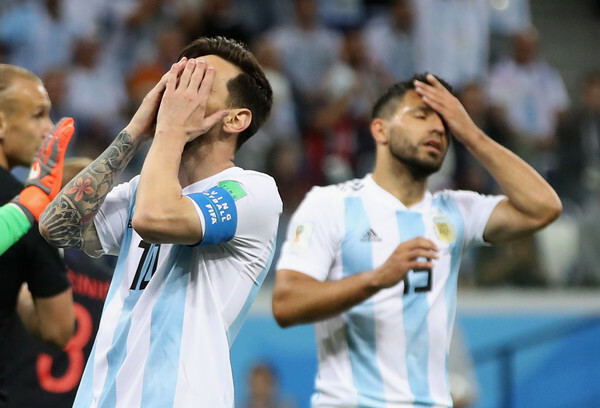 Lionel Messi and teammate Sergio Aguero of Argentina show their dejection during the game against Croatia. Source: Clive Brunskill/Getty Images Europe. Argentina will play the Super Eagles of Nigeria on Tuesday in the last Group D match, a crucial game for both countries. The Super Eagles need to avoid a defeat to make it into the Round of 16 while Argentina must win the game to stay in the tournament. Argentina lost their last game against Croatia 3-0 which puts their World Cup campaign in jeopardy, this loss has led to a lot of disarray and rifts within the Argentina team, players wanted the Argentina FA to Sack Jorge Sampaoli before the Nigeria match. To terminate Sampaoli's contract, the Argentina FA would have to pay a huge sum of money which has made that decision impossible. Latest reports coming out of their camp suggests that the players will decide the team for their game against the Super Eagles of Nigeria. Argentina players will decide the team for their game against Nigeria. The squad have broken their relation with Jorge Sampaoli and he's no longer making decisions. If this news is true, we would like to know if Sampaoli will be on the sideline barking orders or just sit down watching a team he did not pick. So much drama, the current situation should favour Nigeria.